A lot has already been said about what to eat, what not to eat, how much to eat, what time to eat and the points of discussions can go on and on and on….. For that matter even as you read this, I am sure someone somewhere will be discussing this over their morning or evening tea, at the office lunch table, on phone with your girlfriends(ah! !he wonderful backup to discuss any and everything), and honestly these discussions can get a little intimidating, because you almost end up feeling you cannot eat anything!!!! I, was born in a traditional Indian family with intelligent parents(both are doctors by the way) so having a healthy breakfast was a norm. For that matter, skipping breakfast was a concept that I only became aware of when I was around 25 year old and I started overhearing about it around my friends who were ‘going on a diet’. Anyways, these days we have the privilege of having multiple options that you can have for breakfasts. Depending on your diet preferences and routines there a lot of healthy options available. And no, grabbing a synthetic fruit juice doesn’t count as healthy breakfast. I am of the strong opinion (with heavy duty evidence) that Indian breakfasts are healthier options. If you don’t have the time, feel free to eat it just few days a week. But honestly, all of us residing in Indian cities have maids coming in the mornings can easily get it sorted out. And the best part is, you can straight away knock off random chemicals and xenoestrogens that run hormonal havoc in your bodies, in one clean sweep. When you make your breakfast yourself you know exactly what all went in and so does your stomach when its digesting it. This is the best breakfast option you can ever get your hands on, and I am not talking of the ‘ready to eat’ ones, that are avaible in the store shelves. This is the ‘Idly’ made the good old way. Well, no one stopped you from using an electic mixer of course! Just look at the contents!!!!! 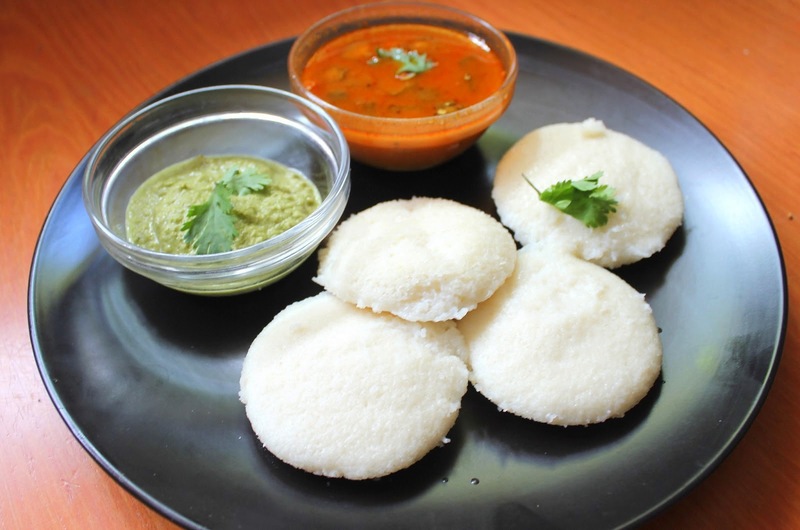 ‘Idly’, is made of Rice and ‘Urad Daal’-perfect balance of carbs and protein. The accompaniment ‘Sambhar’ is again ‘Toor Daal’ with veges- so you get fiber and micro-nutrients too. The best part is the Chutney. Coconut is rich in good fats and when consumed with curry leaf and mustard seeds ‘tadka’, you have a magic concoction that actually reduces the GI of the overall food intake, keeping you full for longer. Now these are flat bread that are traditionally stuffed with seasonal vegetables. So in winters feel free to use radish, cauliflower even ‘Paneer’ or cottage cheese and in summers you can use the old standby potato. Now, the reason ‘Parathas’ have managed getting a bad reputation for being heavy is the way we eat it these days. Traditionally, they were eaten in winters with big blobs of butter that would make your heart stop. 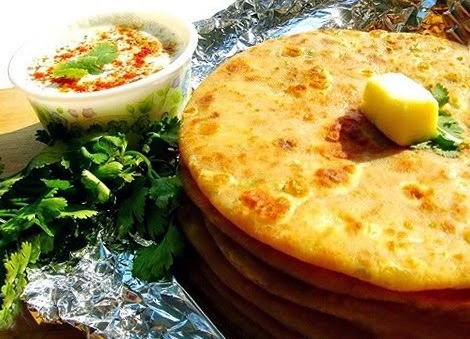 But that’s the thing hot ‘Parathas’ in chilly winter is the best thing to eat not just because you can appreciate its taste better , the butter in it is actually good for you. Keeping you warm through the North Indian winters. The side of curd gives you more protein and helps in easing out any discomfort that the chilies in the stuffing might give you. Again, a good balanced option of carbs, protein and fats. However, you might have to exercise portion control because you might tend to overindulge in them. Now you know -this is a good one!!! 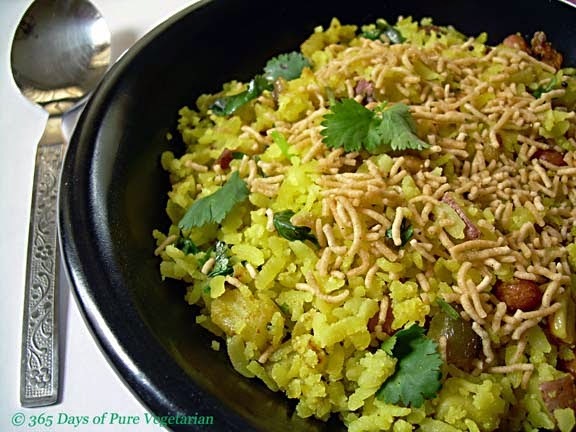 ‘Poha’ is basically puffed and flattened rice and its made with onions, ginger,lemon juice and lots of coriander leaves. It typically has a wonderful sweet, sour, salty balanced taste. Now up north its made with peanuts but during winters peas is a popular addition too. And again it is generally topped of with some ‘Bhujia’ made out of Gram flour which is rich in protein again too. Now there’s a reason why ‘Bhujia’ is so salty and spicy and that’s because its only to be used to enhance the flavor not to be eaten by itself. Fried food traditionally was not consumed how we eat it these days. There used to be specific festivals when you made these. Once in a year!!!! and ate till it lasted and once it was over there was no other option but to wait for the festival to return. Not how we consume them these days out of the store shelves. Its not the food that bad its our eating pattern that has gone completely out of sync from the traditional wisdom which was closer to nature and easier to assimilate by both mind and body. This one is my personal favorite. I can actually eat these for all my meals . Hey! don’t judge me… I really do love them. ‘Cheela’ is typically made of out soaked and ground ‘Moong Daal’ with the skin. Heaps of coriander or fenugreek leaves can be added too.So, lots of roughage there along with protein. 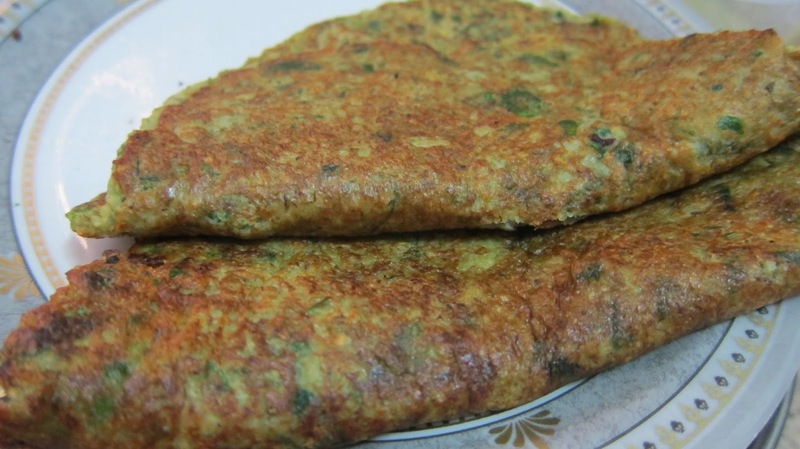 There are some variations out there, ‘Cheelas’ are also made of ‘Chana Daal’, even multi-grain flour. These are a weight watchers best friend EVER!!!! So there you go healthy Indian breakfasts. Make them a part of your breakfast routines and enjoy health and taste together.